I love fruit desserts and this one is a real favorite! Using plums and the last blueberries of the summer give this crumble an autumnal feeling. You can make the crumble without blueberries, I happened to have some leftover when I made this dish and just decided to throw them into the mix, as you can with most crumbles you can alter the fruits you use to suit your own tastes. In the same way you can use pecans instead of walnuts. 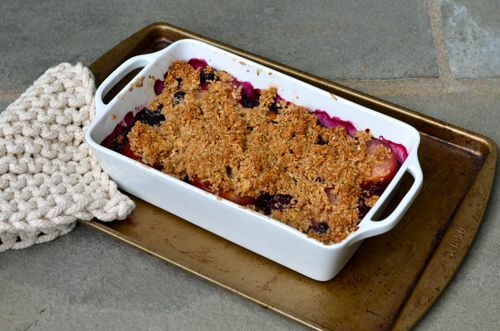 I’ve made many crumbles over the years, but what I like best from the recipe I choose from Huckleberry is the addition of the maple syrup and I used my favorite steel cut oats from Anson Mills that added a great crunchy texture to the crumble topping. Enjoy! From by the bay, wishing you some autumn crumble food memories! Preheat over to 375 degrees F. To make the crumble add all ingredients in a bowl and blend with your finger tips until butter is incorporated. Place in the refrigerator. In a small baking dish approximately 5″ by 8″ arrange the plums, cut side up, sprinkle blueberries. Drizzle with melted butter and sprinkle with 1 tablespoon light brown sugar. Sprinkle the crumble on top of the fruit, letting a little of the outer edges visible. Bake in the hot oven until the topping starts to brown and plums are tender, approximately 50 minutes. Serve warm or at room temperature. It will keep in the refrigerator for up to 2 days. 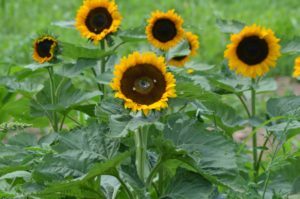 This entry was posted in crisps/cobblers, desserts and tagged blueberry plum crumble, blueberry recipes, desserts, fruit desserts, maple syrup, plum crumble, plum recipes, steel cut oats, summer recipes on September 9, 2015 by entertainingbythebay. As I was growing up, there was no finer signal that fall was near than when my grandmother make plum dumplings. The recipe was one my grandmother brought to the United States from her homeland of Gottschee, which long ago was a part of Austria. My grandfather would grow small italian plums and when they were ripe my grandmother would make dumplings which were similar to large gnocchi, filled with the plums and sugar. You would cut open the dumpling to a burst of purple sweet almost jam like filling. It was delicious!!! Yes, making this dumpling dough sounds a bit daunting , but you can press it into shape easily with your hands and as long as you pick any holes with your fingers you’ll have the same results in taste and perhaps the look is slighlty more rustic, but the taste will still deliver. This is traditionally a dessert but by the bay this is a special dinner. The season for these sweet italian plums are short so celebrate Fall this weekend and enjoy! From by the bay, wishing you plum bursting food memories! Peel and chop potatoes. Place in a medium sauce pan with cold water and 1/8 teaspoon of salt. Bring to a boil and cook until tender. Drain and cool. In a bowl mash potatoes. Measure two cups of mash potatoes and place in large mixing bowl. Add flour and salt and mix well. Add the egg and oil and mix dough to form a ball. Add more flour if the dough is too sticky . Cover with plastic wrap and set aside for 30 minutes. In the meantime, bring a large stock pot of salted water to a boil. On a lightty floured surface roll out the dough to about a 1/3 of an inch . Cut dough into 16 squares or pat into 16 circles, flour your hands to handle the dough. Sprinkle the inside of the plums with sugar. 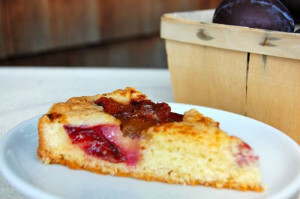 Place one plum ( or 1/2 plum if the plums are medium size) to the center of each circle of dough. Gently bring up corners of the dough to center and pinch edges to seal. Carefully add dumplings to boiling water. Reduce heat; cover and simmer for 20-25 minutes or until a toothpick inserted into a dumpling comes out clean. In a medium sauce pan melt butter until it starts to foam and then add breadcrumbs and saute until they start to brown. Remove from heat. 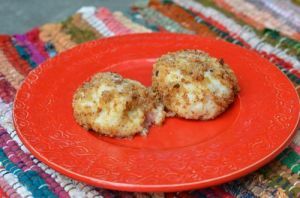 Gently roll the dumplings in the bread crumbs and place on a serving platter. Sprinkle with extra sugar and serve immediately. This entry was posted in desserts and tagged dessert recipes, dumpling recipes, fall recipes, German food, German recipes, plum recipes on September 25, 2014 by entertainingbythebay. It’s my first Sunday home after an inspiring vacation in Nashville, Tennessee! The food was so delicious and clearly many people are living the farm to table lifestyle, especially with the close proximity of farms to downtown Nashville. My weekend back home started with the trip to my local farm, where I found the ingredients to make a delicious late summer fruit compote of blackberries, raspberries and dark plums. 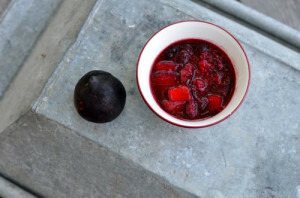 This autumnal colored compote is a sweet complement to use at breakfast on top of french toast , pancakes or waffles, or at dinner on top of a pork chop or even for dessert on top of ice cream or a slice of pound cake. 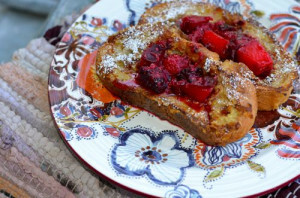 I decided today to recreate my Nashville experience with bourbon soaked french toast along with the mixed berry and plum compote. It’s a perfect brunch dish for s slow, relaxing Sunday in New York. From by the bay, wishing you bourbon soaked food memories! Preheat oven to 200 degrees F. Set aside baking sheet with rack to hold french toast warm in oven. In a medium mixing bowl whisk together the milk, sugar, bourbon, vanilla, eggs and cinnamon. Pour into a shallow dish, I use a glass pie plate. Dip the bread into the batter and let sit a minute or two to soak. Add butter to a hot griddle or non stick saute pan. Once the butter is melted place the battered bread on the pan and cook until the bread becomes golden brown. Flip the bread slice over and cook until the other side also becomes golden brown. Place toast on rack in warmed oven and continue to make your french toast using butter as needed. Once done place onto a platter and shift confectionary sugar on top. 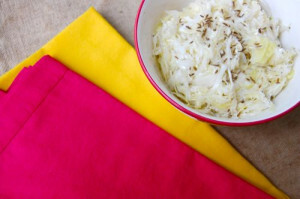 Serve with butter and maple syrup or fruit compote. Place all the ingredients into a non reactive medium sauce pan. Bring to a boil, lower heat and simmer for about 15 minutes or when the plums are softened. Serve at room temperature. Can to stored in the refrigerator for about a week. 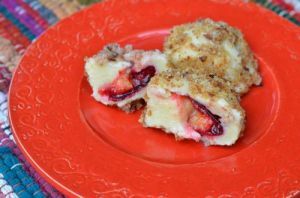 This entry was posted in breakfast and tagged Bourbon recipes, breakfast recipes, compote recipes, egg recipes, french toast recipes, mixed berry recipes, Nashville, plum recipes, summer food, summer recipes, vanilla recipes on May 25, 2014 by entertainingbythebay. My grandparents would grow italian plums on their small weekend farm. We always looked forward to early fall when we would have a short but sweet time to enjoy these little purple treats. When I found them at the local farm stand, I bought a big basket of plums and tasked myself with the best way to enjoy them. 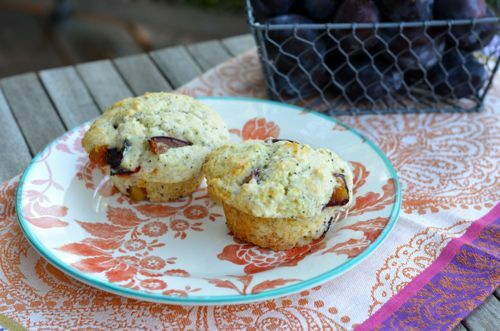 This weekend, the plums were worked into a delicious lemon and poppyseed muffin. It was a delicious combination and one I’m sure you would enjoy too! Hurry and buy some italian plums before they are gone for the year. 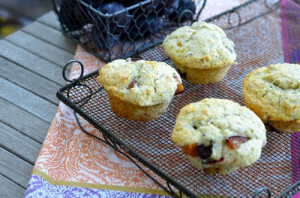 Preheat oven to 350 Degree F. Lightly grease a standard muffin tin or use paper liner. Sift together in a bowl the flour, baking powder, baking soda and salt. Stir in poppy seeds and set aside. Using an electric mixer cream butter and sugar together until fluffy. Add one egg at a time, beating to combine. Using a wooden spoon to mix, alternate adding the flour mixture with the milk, buttermilk, and lemon zest. Add plums and combine, try not to over mix. Pour the batter evenly, into each muffin tin, filling the cup almost to the top. Bake muffins in the oven for 25 to 30 minutes, until a tester comes out clean. Let cool slightly, and remove muffins from the tin. Serve warm or cooled at room temperature. This entry was posted in breakfast, muffins and tagged baking, egg recipes, lemon recipes, muffin recipes, plum recipes, poppy seed recipes, summer food, summer recipes on May 25, 2014 by entertainingbythebay. On my grandparents farm on Long Island, they had a full orchard of fruits trees. I would help my grandfather with tending the orchard from pruning to netting the trees to hanging little wooden snakes to scare off the birds. One of our favorite crops were the italian plums. We would gather the plums and my grandmother would made her close friend Mitzi’s plum cake. This recipe is a wonderful yellow cake that envelopes the plums. It’s easy to make and delicious to eat. We would just feast on those tiny jewel like fruit! I’m also including one of my favorite barbecued pork chops recipes served with a wonderful plum sauce. Hope you enjoy this food as much as we all do here by the bay! From by the bay wishing you the plummiest of food memories! 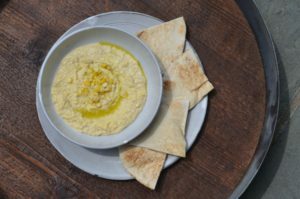 PS Remember to subscribe to my weekly blog, so you don’t miss out on my new recipes. Place pork chops and all marinade ingredients into a sealed plastic bag and mix well. Place in refrigerator for a minimum of 4 hours up to overnight. Remove from marinade and grill pork chops on a hot grill for approximately 8 minutes per side to be well done. In a large sauté pan, heat olive oil and add shallots, sauté for 2 minutes until soft. Add the plums and simmer for 15 minutes, add honey, wine, balsamic vinegar and ground ginger and continue to simmer until the liquid is reduced in ½ and thickened. Keep warm until ready to serve. 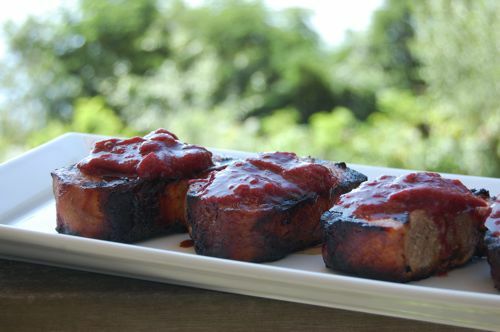 Serve warm fresh plum sauce on top of the grilled pork chops. 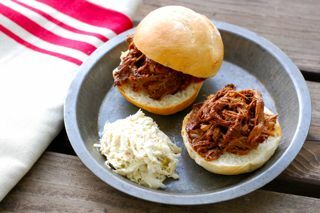 This entry was posted in main dish, pork, Sauces and tagged grilling food, merlot recipes, plum recipes, pork recipes, summer foods, summer recipes, wine recipes on May 23, 2014 by entertainingbythebay. Preheat oven to 350 degrees F. Split plums and remove pits. Place plums in bowl, cover with lemon juice, mix and set aside. Using electric mixer combine ¼ lb butter and sugar until fluffy, then add egg and combine. Next add the flour and baking powder and combine. This makes a soft dough. Take an 8” non stick cake pan line with parchment and butter and flour the pan. Press the dough into the pan covering the bottom of the cake pan. Use a spatula to spread evenly on the bottom of the pan. Press plums into dough with the cut side facing up in a concentric circle. Combine 1 teaspoon sugar with ½ teaspoon cinnamon, mix and sprinkle on top of the plums. Dot with extra butter. Bake for approximately 45 minutes, until cake tester is clean. 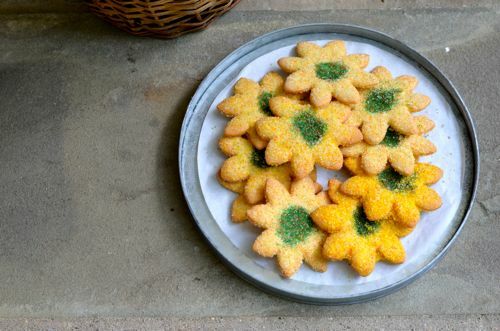 This entry was posted in cakes, desserts and tagged baking, cake recipes, citrus recipes, easy recipes, egg recipes, German food, German recipes, plum recipes, summer food, summer recipes on May 23, 2014 by entertainingbythebay.